Ice Box CookiesCream together brown sugar and margarine. Add eggs. Sift together flour, soda and cream of tartar; stir into first mixture. Add pecans and vanilla. Glazed Ham on the GrillBring brown sugar, horseradish and lemon juice to a boil. Put ham on grill and baste with brown sugar mixture. Cook for about 10 minutes on each side. Baste both sides. Mom's Meat LoafCombine all ingredients except tomato sauce; mix well. Mold into a loaf in a shallow baking pan. Bake at 350 degrees F for 1 hour. Chocolate FudgeCombine sugar, milk, salt and chocolate. Boil to soft ball stage, 235 degrees F. Add vanilla and butter. Beat until mixture is creamy, thick and will hold it's shape when dropped from a teaspoon. Fluffy Potato and Frankfurter CasseroleMelt 2 tablespoons margarine in small frying pan. Saute' onion over low heat just until tender. Beat onion, remaining margarine, milk, salt and pepper into potatoes. 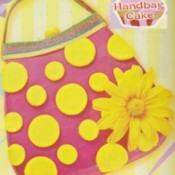 Handbag Cake Recipe in Just 1-2-3!Totally tasty! A yummy gift for your loved ones. Make up cake using directions on packet and pour into a greased and lined 205x205mm square cake pan. Kentucky Style Fried ChickenMix together all the coating ingredients and place in a clean plastic bag. Dip each piece into beaten egg, then into the flour mixture in the bag. 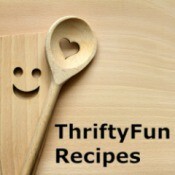 Cottage Cheese SaladDissolve gelatin in water and let cool until slightly thick. Beat cottage cheese in a bowl until very fine. Add cooled gelatin, Miracle Whip, milk, pineapple and horseradish. 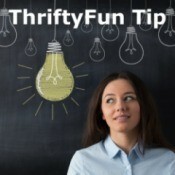 Be Wary Of Flea Medication AllergiesPlease test your cat for allergies to flea meds by applying only one drop at a time. Flea meds almost killed my cat. I've been up all night, every hour force-feeding water to my cat. 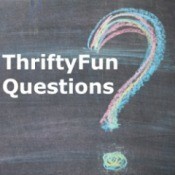 My Frugal Life: Consider Crafting for ChristmasFor many years we had to live like lots of Americans, payday to payday. But December of 1977 was the worst. Everything hit that month and we ended up with only 5 dollars in our pocket with just 3 days left before Christmas. 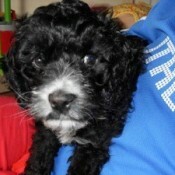 Piccolo (Cocker Spaniel/Poodle)Piccolo is 8 weeks old and a Cocker Spaniel/Poodle (Cockerpoo or a Spoodle). He's lovely. We got him for company for my 9 year old, who has a medical condition so doesn't get to school or really have any social life. He's been all the healing she needs. 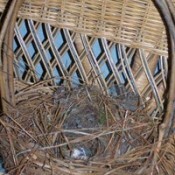 Wildlife: Birds Nest BasketHere is a photo of a grapevine basket that I had placed in our garage. I was going to use it for something else. What a surprise to find that a mother bird decided to use it to build her nest! Ideas for Reusing Large Size Creamer BottlesFor my Kindergarten class at Sunday School, we made Santa toys out of Liquid Coffee Mate bottles. The white bottles have red caps that are shaped as Santa's hat. Salmon (Mackerel) GravyI make salmon gravy with mackerel. First make your gravy and debone the mackerel. Use your hands and break the mackerel up and add to the gravy. You can use the juice too but I do not like to use it. Cook Pasta and Eggs at the Same TimeSave cooking time and pans, by cooking pasta and eggs at the same time. Place pasta in boiling water, and disperse pasta so the noodles do not stick together. Put the in eggs from the fridge, and return pot to a boil. 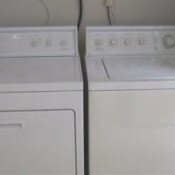 Buy Second Hand AppliancesWe sold our 3 bedroom home and moved into what is known as a 2 bedroom apartment home. We sold all our appliances with the house because we just didn't want to move them. Save Extra Fast Food NapkinsWhen eating out at fast food restaurants, we are usually given too many napkins that end up in the trash. Now we fold them up and take them with us. 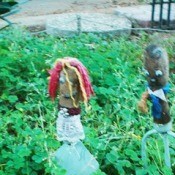 Garden Tool PeopleHere are a couple garden people made from garden tools. 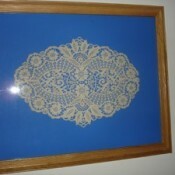 Craft: Doily DisplayTo make an heirloom picture, I bought a large frame from a garage sale, a doily that was in my family and rather fragile, and a sheet of blue and mount the doily and you have a beautiful memory to hang on your wall. Harvesting and Uses for Crab ApplesSpread 2 bed sheets under tree canopy from trunk to outside edge of tips of limbs. Using an inch and half PVC pipe with a (Y) fitting attached to the tip of 8 foot section of pipe. Rewash Unmatched Socks to Find MatesI do a lot of laundry. When I discover the unmatched socks, they go into a small basket nearby. The next time I run the white load through (or the color load for colored socks), I add the mismatched socks to it. Knitting and Crochet TipsA while back, a woman asked about how to knit or crochet. Here is what you do. You make a loop with your yarn and place it on your knitting needle, that will be your lead needle. Food Freebies for Your BirthdayBest of all you don't have to go on your birthday. They give you about a 2 week window of time to use the coupon. Removing Hair from LegsI am a female who has very coarse hair on her legs. I can not find a razor that gives smooth results. Any suggestions? TGI Friday's Cajun ButterDoes someone know where can I get "Cajun Butter"? The kind that is used in TGI Friday's. Dog Digging up PlantsI have my garden in containers. My dog has never shown interest in my garden until today. He's destroyed 3 of my okras already. He's not eating the plants just playing in the dirt in the pots. Preparing Raspberries for FreezingWhen freezing raspberries, do you wash them first? Removing Scuffs from Prada ShoesHow do I remove black scuffs on Prada shoes? Buying Pop Up Camper CurtainsI want to buy a new set of curtains for the used Pop Up camper we bought. Does anyone know where I can get them? Corned Beef RecipesI am looking for ideas for cooking a corned beef. Reprogramming Keyless Car EntryHow do I reprogram my keyless entry code on my car? Decorating a Small Master BedroomI am looking for ideas to decorate a small master bedroom. Weather Damaged Peach TreesI planted 3 new peach trees approximately 2 months ago (had buds). About a week after planting, we had frost twice, nipping the buds. Within the last month, it has rained about 8 inches and they are waterlogged. Hatching Wild Finch EggsI have enjoyed watching Finches in my yard until today, when a Blue Jay (I think) tore the nest apart. I shooed it away, but there are three eggs left which the Jay wouldn't leave alone. I brought them inside. Starting a School Gardening ProjectI'm starting a gardening project with grades Pre-K to 4. We have a very small section of land. I would like ideas. Thank you. Cleaning a Saltwater BoatDo you have any tips for cleaning a saltwater boat?